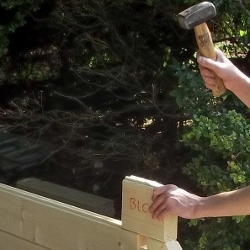 If you are buying a garden log cabins for self build you will probably need a bit of help knowing where to start and what to do. Our delivery team will run through things with you when they are unloading but we have also provided some instructions which you can download and look through in advance or print off and keep with you as you are building. Even if you have built log cabins and used roof shingles before it is still a good idea to read through the instructions just in case there is something a little bit different. We have also included some handy hints and tips for you.